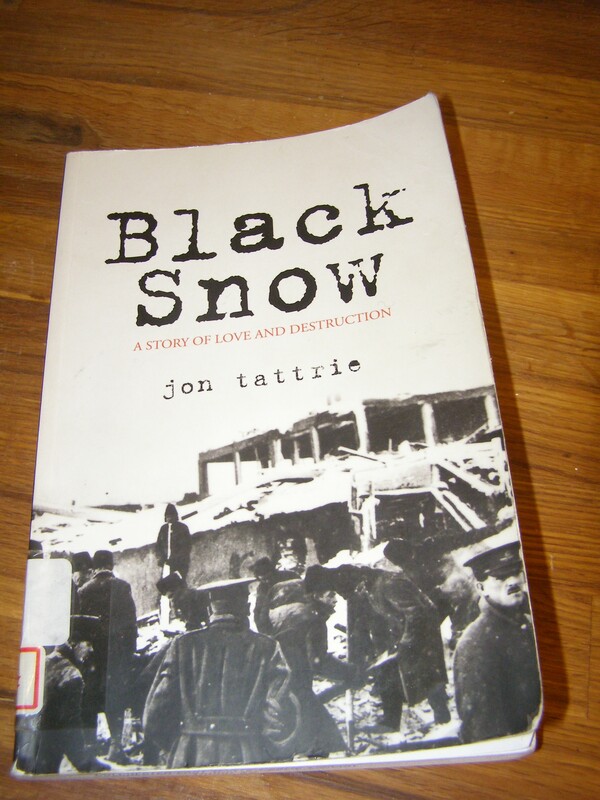 Black Snow takes us from the trenches of WWI to the devastation of the Halifax Explosion. At just 200 pages, it is a whirlwind of a story; it will heat you up, cool you off, make you mad, make you happy, and make you cry. On the morning of December 6, 1917, two ships collided in the Halifax Harbour. One was carrying a full load of wartime explosives. The blast that resulted was the largest man-made explosion prior to the development of nuclear weapons. Nearly all structures within a half-mile radius were completely destroyed, and nearly all the windows in the city were shattered. Over 1600 people were killed instantly, while another 9000 were injured. Hundreds of people who were watching the fire out their windows were blinded when their windows shattered. The shock from the blast was felt as far away as Cape Breton and Prince Edward Island. To learn more about the explosion, damage, rescue efforts, and survival stories, including photos, visit The Halifax Explosion website. My brief summary came from Wikipedia. Behind them a sulphurous black cloud swirls out of the harbour, painting the air pitch black. Red-hot steel falls from the sky, impaling a teenage boy. He falls and the mob runs right over him. This is the backdrop to the story about Tommy and Evie. The story jumps around in time, piecing together Tommy and Evie’s story from before the war until the day after the explosion. Through their story, we learn about what it was like for thousands of people following the explosion; the effects of the blast, the rescue efforts, the blizzard that followed, the orphaned children, the despair of being the only one left alive in your family, the hopelessness of the search for survivors. Those who have lost a little wail and cry; those who have lost everything are silent. As Tommy desperately searches for Evie, we learn of his experiences in the war, his violent flashbacks after he returns home, the life he and Evie had both before and after the war. If he is lucky enough to find Evie, Tommy hopes for forgiveness and another chance. The snow is lovely. It’s a slow, wet snow. It’s thick white paint on the trees clinging to everything, wrapping around branches, filling the roads, silencing the horror, blanketing the bloody land with warm amnesia. In this unreal city, lit white in the black night by the flames, snow falls fearlessly into the fires, smothering the heat, waging a relentless war it knows it will win. It comes sideways into my face, coating my eyebrows, stinging tears from my eyes, sliding down my chest. A wind claws my skin through the thin shirt I’m wearing. I pull myself through the accumulating beauty, my bootless foot red and aching. I roam for hours, miles, centuries, running from the terrible present. The day can’t end if I’m still awake. None of this is real until I sleep. This book is full of horror, sadness, and a steamy love affair. I couldn’t put it down. To have Tommy come home from the trenches with a bad case of shell shock, then end up in the horror of the explosion was gut-wrenching. I highly recommend it as a fast-paced, engrossing read with valuable historical content. But I do have to warn you that it contains graphic images of war and death. Jon Tattrie is based in Halifax, Nova Scotia. He has written 3 other books, this one being his first work of fiction. He’s won seven awards for his writing, including three Atlantic Journalism Awards (silver) and two Best Book awards from the Coast. This sounds devastating. My creaky old memory won’t tell me where I’ve heard about this event before, but I know I have. It was pretty devastating. I can’t even imagine what it would have been like to be there, which is what makes reading about it so fascinating! Now I am curious to know how wide spread the awareness of the Halifax Explosion is. Maybe it is mostly here in Canada. Boston must know about it, though, as they were a major force in the relief efforts (hence the annual Christmas Tree from Nova Scotia). Any Bostonians out there? I’m constantly amazed by how many events and people are out there who I haven’t heard of. My guess here is that, growing up in Germany, the focus of WW1 was on different events (as it should be). BTW, the ebook edition for Kindle is currently free here in the U.S.! That’s one of the reasons this book blogging community is so great- I get to learn new things all the time. And, hopefully share a few! You had me at “make you cry,” Naomi! I hadn’t heard of the Halifax Explosion before this (I’m not the best at history…) but this seems like such an interesting read! The quotes you pulled are so beautiful; I’m putting this on my to-read list! Ps. It’s free for Kindle in Canada as well – I just downloaded it. Hurray! I love books that are a great read, but can also be a way to spread the word about something (in a fun way)! Wow! How could I not have heard of this tragic event? Even your review of this book was riveting, and I know I am going to have to read this book. Thanks so much for sharing it. The explosion makes very fascinating reading, and has been written about a lot around here, but mostly in nonfiction form. Since I prefer fiction, I really enjoyed this book. Perfect for anyone who has never heard of the event and wants to learn about it! If you end up reading it, let me know what you think! I currently have on order a new novel set during this same event, and I am very curious to see how they will compare. Ooh, another interesting book based on Canadian history. You really are good at finding them! They really are favourites if I can find good ones. I love history, but prefer to get it in my fiction, rather than nonfiction. I just ordered another novel that recently came out, also set during the explosion. I am anxious to get it and read it, so I can compare the two!